So it was amusing to see Timothy Mould QC — representing the Department for Transport at the HS2 LWM Bill committee — rubbishing Mr McLoughlin’s claim that Crossrail Hertfordshire would “provide flexibility when building HS2 into Euston”. MR MOULD QC (DfT): In order to construct Euston Station on your phased approach you require the west coast main line Crossrail link to be in operation, do you not? That is your diversion strategy. MR ELLIFF: It would require that to be in operation while we have constructed maybe the first four platforms on the west side before founding my construction site. MR MOULD QC (DfT): Our estimate is that it would take us up to 2026 to construct the west coast main line to Crossrail link. In a “keynote speech” in Leeds on 1 June 2015, transport secretary Patrick McLoughlin stated that, ‘building on the concept of High Speed 3 (HS3), the government would progress plans to transform east to west rail connectivity with high-speed services linking Liverpool, Manchester, Leeds, Sheffield, Newcastle and Hull, radically reducing travel times, increasing frequencies and improving the customer experience’. But so far as can be established, Mr McLoughlin’s new “high-speed services” would only run at speeds achieved on a daily basis, on existing lines, since October 1976. According to The Guardian’s article of 10 January 2012, Britain had just 71 miles [~114 km] of high speed railway, compared with Germany’s 803 miles [~1293 km]. However, most of Germany’s high speed rail mileage is made up of existing track that has been upgraded for higher speeds. The British “71 miles” figure referred only to the Channel Tunnel Rail Link (HS1). If the upgraded existing trackage in Britain were included, the situation would look quite different. The problem with viewing HS1 as ‘high speed’ is that the entire western section is severely speed-restricted (and most of the trains using it — Class 395 — rarely exceed 200 km/h in service). Oddly enough, the 2015 Northern Transport Strategy Autumn Report does not seem to mention “high speed”, or “HS3”. One agenda. One economy. One North. According to the Department for Transport’s November 2015 Supplement to the October 2013 Strategic Case for HS2, commuter trains on the West Coast Main Line are less punctual than on other routes, partly because of the intensity of operation. Recent London Midland punctuality was 83.2 per cent compared to 88.7 per cent for the wider London commuter network. are not particularly convincing. Most Euston commuter trains do not run on the ‘intensively-used’ Fast lines; they use the Relief (‘Slow’) lines. In the peak, there are just eight London Midland trains per hour on the Slow lines, which is not particularly intensive. Eight London Midland trains per hour on the WCML Slow lines in the peak, is that ‘intensive’? Anyone who thinks ‘HS2 would allow a more punctual classic service by reducing the number of trains on the Relief lines’, might need to study the ‘before’ and ‘after’ service pattern in Professor Andrew McNaughton’s February 2015 presentation (below). In March 2004, when transport secretary Alastair Darling opened line 1 of the NET tramway in Nottingham, he refused to endorse any extensions or new starts, saying that the government would not ‘pay more and more for less and less‘ (url appears correct, but the Beleben blog is apparently not an approved referrer). Unfortunately, some of his successors have been all too willing to throw money into highly dubious light rail projects, such as Manchester Metrolink’s Airport line, and the Birmingham City Centre Extension (BCCE) of the Midland Metro. After years of construction disruption, the first section of the BCCE — to Upper Bull Street — is now scheduled to open on 6 December. Opening of the rest of the track through to Stephenson Street has been postponed to early 2016. Oddly enough, there are no active plans for tramways in central London, where they could plausibly offer transport benefits. Because of the time needed to reach Underground platforms, surface tram travel would be faster for many journeys in zones 1 and 2. According to the Department for Transport’s November 2015 Supplement to the October 2013 strategic case for HS2, “Today, the WCML Fast Lines carry 15 – 16 trains per hour (tph) at the busiest peak periods” [section 3.1]. But it goes on to say that operating 16 trains on the West Coast fast tracks into Euston ‘across the peak’ would cost £2.5 billion. So, at the moment, Network Rail are managing to run 16 trains during some peak hours, without spending £2.5 billion. But to, er, run 16 ‘across the peak’ would cost £2.5 billion. Does that make sense? [4.5] The report HS2 Strategic Alternatives, Final Report set out the alternative options for meeting the capacity and connectivity objectives set by Government when developing its plans for HS2. The most relevant option to compare against the impact of HS2 in the WCML corridor was termed “P1”. This contained a package of measures, some of which had been put forward by objectors to HS2. [4.6] P1 assumes that all West Midlands [London Midland] and Inter City West Coast (ICWC) peak trains into Euston are run at maximum length and reconfigured as in the crowding analysis set out in Chapter 4. However, in addition to this, P1 includes a package of infrastructure enhancements that would increase WCML Fast Line capacity from today’s 15 – 16 [trains per hour] into / from London Euston in the peak periods to 16tph across the peak. These have been costed at £2.5 billion and include the grade-separation of junctions at Colwich and between Cheddington and Leighton Buzzard, four-tracking between Attleborough and Brinklow and further power supply upgrades and line speed improvements. What exactly have “Dynamic passing loops at Shap and Beattock”, to do with capacity on the London approach? 3. there are numerous cost-effective ways of substantially increasing capacity on the London approach, which have not been proposed or evaluated by Atkins or DfT. Their costs are trivial, compared to HS2. Transport for the North has commissioned Network Rail and HS2 Ltd ‘to identify options to meet, or move towards meeting the Northern Powerhouse Rail vision‘. We have commissioned Network Rail and HS2 Ltd to identify options to meet, or move towards meeting the NPR vision. They are now carrying out a series of studies to establish the scale of investment that each option would require. This includes looking at making use of the HS2 network where possible, upgrading existing routes, and the construction of brand new railway lines. We are also assessing the investment needed within cities, both at stations and on cross-city routes, to enable the fast through journeys that will make up a coherent network rather than a series of point-to-point links. Emerging findings from this work show that entirely new lines, or in some cases major bypasses and cut-offs, may be needed to deliver the connectivity vision in full, and we are developing these route options. In certain locations, HS2 will play a part in delivering the transformational NPR vision. On the existing network, express, semi-fast, local and freight services run on the same, often two-track railway, limiting its capacity to deliver transformational changes in speed or frequency. We are also increasing our understanding of the major challenges in meeting aspirations for NPR at some city centre stations. Between Liverpool and Manchester, there may be the potential to use the proposed HS2 infrastructure to cover approximately half the distance between the two cities. Our initial work indicates such an option would also require a new line from Liverpool to the proposed HS2 route, as we have found little or no scope to achieve our vision for journey times and frequencies through incremental upgrades to the existing rail routes. Such a new line could also permit faster HS2 services between Liverpool and London. 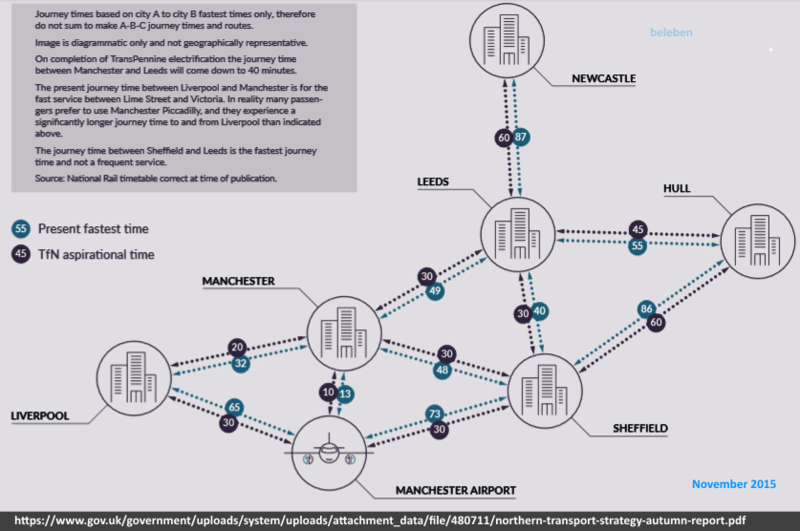 On routes between Manchester and Leeds and Manchester and Sheffield, our work so far suggests that very significant sections of new line would be needed to achieve the vision for journey times and service frequencies. However, if provided, these could free up capacity for additional local passenger services, better serving key intermediate centres and rail freight. The proposed HS2 route offers significant potential to provide a fast link between Leeds and Sheffield. For Newcastle and Hull, packages of upgrades to existing lines, electrification, and faster trains could improve journey times and service frequencies between the North East and Humber areas and the rest of the North. We are exploring the potential to make more intensive use of the HS2 eastern leg connection to the East Coast Main Line to address the key constraint of line capacity east of Leeds, as well as options on the East Coast Main Line to Newcastle and routes to Hull. Liverpool – Manchester high speed rail: how much quicker than the existing Chat Moss railway? Needless to say, extending HS2 into Liverpool would cost billions, and the potential journey time saving over the existing Chat Moss route for travel to Manchester would be minimal, especially if trains stopped at the poorly-sited Manchester Airport HS2 station. Furthermore, Manchester Piccadilly HS2 has been designed as a dead-end, which is obviously very awkward for notions of running trains from the Mersey to the other side of the Pennines. Given the need to fix all the antiquated and unsatisfactory transport infrastructure in the North, it is astonishing that money is being frittered away on nonsense schemes like this. In yesterday’s HS2 Leeds options report, David Higgins stated that the original design for the city high speed station would not ‘stand the test of time’ and had ‘compromised connectivity’. But as is plain to see, compromised connectivity is the norm across the entire project.